Melilla passenger and car ferry ticket prices, timetables, ticket reservations and information for ferries sailing from Melilla to Almeria and Malaga. Compare all available Melilla ferry ticket prices in real time and book the cheapest available Melilla car and passenger ferry tickets sailing to and from Melilla, Almeria and Malaga with Acciona Ferry Line ferries online with instant confirmation. Book Melilla Ferry Tickets with Acciona Ferry Line for ferries sailing from Melilla to Almeria and Malaga online in advance to enjoy the cheapest available ferry ticket price. The price you see is the price you pay. There are no hidden extras or surprises such as added fuel surcharges or booking fees and we do not charge you anything extra for paying with a Visa Electron card. The price we quote you for your selected Melilla passenger or car ferry ticket, onboard accommodation and vehicle type is all you will pay, and that's a promise. To obtain a Melilla ferry ticket price and book your ferry ticket securely online please use the real time ferry booking form on the left. You are also able to add a hotel at your destination, or anywhere else, to your ferry ticket when completing your ferry ticket reservation. The city of Melilla is a window from which you can see two continents. An enclave in North Africa for more than 500 years, bathed by the Mediterranean sea, where the visitor willing to know unexpected flavours may find a holiday full of exoticism, cultural variety and outdoor activities. From the charm of its ancient Citadel walls to the explosion of colour of its Modernist architecture of over 900 Modernist and Art Deco buildings, Melilla offers the visitor a never-ending variety while walking through the city streets. ew people are aware of the multiple attractions that invite one to discover the city of Melilla. From the absolute treasures displaying the splendour of a city with a history as a meeting point of two continents, to the beaches of fine sand between the city and the Mediterranean sea. Melilla (Mrič in Berber) is an Spanish autonomous city located in northern Africa, in the Eastern part of the Rif mountain range. It is situated on the coast of the Mediterranean Sea in front of the coasts of the Iberian Peninsula, of Almeria, Grenada and Malaga. It has a very important port and beach, in the Tres Forcas Cape, close to the Gurugú Mount and the Oro river mouth. The village is 1 metre above the sea. The surface area is approximately 5 square miles (12 square km). The original city centre was a fortress built on a hill of some 30 m high from where the territory was dominated in which now the modern city is located. The climate is typically Mediterranean, mild and humid, with east and west winds and occasionally winds from Sahara. Average temperatures in Melilla reach 13ºC in winter and 24ºC in summer. Due to the tourism importance in Melilla, it offers leisure activities in both its cultural and natural environments, a great number festivities that give brightness to the city. As its weather is one of the mildest in the Mediterranean, this city is a destination to enjoy throughout the year. The ferry company Trasmediterránea offers six sailings a week to the Ports of Malaga and Almeria, thus providing a number of links between Melilla and mainland Spanish ports, including the fast ferry (running from June to September) with cabins, and a 'Canguro' vessel, which offer both cabins and reclining seats for up to 1,000 passengers. The boat can also carry 250 cars and 500 metres length of cargo. The culinary manifestation of Melilla's cultural wealth is an extravagant melange of tastes and aromas offering an enormous variety of choices to the gourmet. As a Mediterranean city, Melilla maintains and promotes the typically Spanish tradition of 'tapas' and tidbits accompanied with a fine wine or thirst-quenching beer. Every bar has its own 'tapas' speciality, and there are three areas that are particularly known for them: the centre, the area around the Promenade and the Real district. The city 'tapas circuit' is a must. The Mediterranean cuisine is drawn principally from the sea: fish specialities include whitebait, fresh anchovies, squid, sardines, and anchovies in brine; a wealth of shellfish includes lobster, crayfish, prawns and the exquisite king prawns, as well as mussels and clams fried up in delicious tasty mixtures. The cultural melting-pot of Melilla is also evident in the Arab preparation of many ingredients and in the skilled use of herbs and spices. Another must is the typical 'pincho Melillense', accompanied by a mint tea that can only be found in this city, or a dish of delicious couscous, full of Mediterranean flavour. The origin of the city of Melilla comes from the Phoenician colonization of the Western Mediterranean. Since the 6th century BC it had been in Punic hands, and later passed to be part of the Roman Empire. In the year 429, after passing through Hispania, the Vandals ventured to the North of Africa, devastating the Mauritanian provinces, on their way to Carthage. With the Muslim expansion, the area where Melilla is situated was conquered at the end of the 7th century. In 859, with the Viking incursions into the Mediterranean, Melilla was looted and burned down. In 927, Abd-ar Rahman III incorporated it into the Cordovan emirate, which would later become the Cordovan Caliphate. The link with al-Andalus had a short duration, and Melilla became a sore point between the sultans of Fes and Tlemcen, to the point of being destroyed and almost depopulated. The 15th century witnessed the beginning of Portugal’s expansion in the Kingdom of Fes, and the Catholic Monarchs who joined the expansion. In 1497, the conquest of the city by Castilian troops took place. In 1509, the Agreement of Sintra re-established the borders of the North African influence between Portugal and Castile, establishing that Portugal would dominate the Atlantic Coast from Ceuta, leaving the Mediterranean for Castile. From then on, the city became continuously subjected to hostilities by the “rifeños” (local sub-Saharan tribes). In 1860, the Treaty of Wad-Ras with the sultan of Morocco was signed. Through this treaty, the borders between the Moroccan territory and the Spanish city were established. The Moroccan War, which continued intermittently in the area during the beginning of the 20th century, was particularly critical to Melilla. The military uprising, which encouraged the Spanish Civil War started on 17 July 1936 in Melilla. For that reason, the pro-Franco propaganda referred to this city as "La Adelantada" (“The Forerunner”). Since the end of the Spanish and French protectorates over Morocco, in 1956, this country claims the city as part of its territory. On the other hand, the Spanish Government has never maintained any type of negotiation on the matter. With such a melange of cultures, there are different celebrations in Melilla at nearly all times of the year. Following the solar calendar, Christian religious festivities include not only Easter, Christmas and the Epiphany, but also the festivity of Our Lady of La Victoria and St Francis of Assisi (patron saints of the city). The main Islamic festivities follow the lunar calendar: Ramadan, Id El-Fitr (marking the end of Ramadam), Aid El Kebir (the Feast of the Sacrifice), Mulut (commemoration birth of the Prophet), Achra (“El Diezmo”), and the Muslim New Year (Muharram). The Jewish community also follows the lunar calendar, and their main festivities are Purim (the Carnival), Pesaj (Easter), Shavuot (Pentecost), Ros-hashaná ( New Year) and Yom Kippur (the Absolution festivity). The Hindu community, the most recent settlers in Melilla, celebrate Diwali which is the Hindu New Year festivity. Best Price Guarantee - We always offer you our lowest available Acciona Ferry Line passenger and car ferries ticket price to and from Melilla. There are no hidden extras or surprises such as added fuel surcharges or booking fees and we also we do not charge you anything extra for paying with a Visa Electron card. The price we quote for your selected Melilla ferry ticket, onboard accommodation and vehicle type is all you will pay, and that's a promise! In the unlikely event you find the same all inclusive Melilla ferry ticket cheaper in the brochure of any other tour operator we promise that we will do our best to beat that price or offer you the choice of requesting a refund. 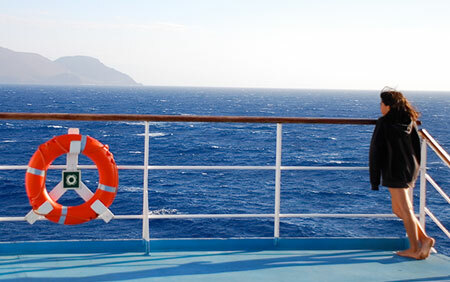 To book Melilla car and passenger ferry tickets please click here. At ferryto.com you are able to obtain live Melilla ferry ticket prices, check availability and book car and passenger ferry tickets to and from Melilla at our lowest available ticket price. Ferryto.com is part of the world's largest online ferry ticket distribution network providing the ability to book over 80 major European ferry operators including to Melilla and to over 1,200 other ferry routes throughout the UK, France, Spain, Ireland, Holland, Eastern Europe, the Mediterranean, the Baltic and North Africa.